We all know we use a mix of aerobic and anaerobic energy in cycling…and sometimes it can feel like our anaerobic efforts (and thus anaerobic training) are more important. In part 1 of this series, we defined anaerobic vs. aerobic phsyiological energy systems and analyzed how much a stage from the Tour de France required use of our anaerobic systems. In part two, we’ll take a look at pro race files through the lens of Power Zones to see just how anaerobic or aerobic our sport really is. 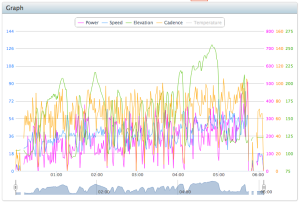 To do this, we use the TrainingPeaks Power by Zones chart. 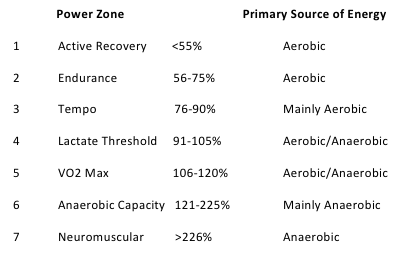 The Power by Zones chart provides the percent of time pedaling in all power ranges during a training ride or race. The seven power zones used to analyze each race file are from Andrew Coggan’s Power Training Levels. All levels are a percentage of Lactate Threshold (LT) power. The main source of energy for each training zone has been established using a percent of each rider’s maximal power outputs, compared to the primary energy system stressed on the “Training Specific Energy Systems” chart from part 1. For this article, and slightly different than how Dr. Coggan calculates each training zone, I placed a numerical value for Zone 7 to further define anaerobic efforts within a race. Zone 7 is set to display power outputs greater than 226% of threshold power – equivalent to approximately 75-100% of each rider’s maximum power output range and mainly anaerobic (refer to article one for explanation). Let’s analyze and compare two disciplines of road racing and two disciplines of mountain bike racing to show how much aerobic and anaerobic metabolism plays a role in each race. As you can see by looking at Greg Henderson’s (Lotto-Belisol) power data, 93% of the 214.5km stage and 83% of the time trial race took place between zones 1-4, showing that both race efforts relied heavily on aerobic metabolism. This is not to say that anaerobic metabolism does not play a role, it definitely does. 38% of the TT effort is spent between zones 4-6, compared to 12% for the 214.5km stage, showing that the TT effort relies on more anaerobic energy than a long distance road race but the majority of the race is still mainly aerobic. It is important to note that Greg spent 29 seconds in Zone 7 during the 214.5km stage race, within the final minute of the race sprinting to the finish line. That represents .001% of the race so it is not displayed but it was a very important part of the race, if not the most important. He also spent zero percent of time in zone seven during the TT effort. When looking at both mountain bike races from Jeremiah Bishop, we see that 92% of the 100-mile Cohutta race and 76% of the Pro XC race was spent between Zones 1-4, showing that both of these race efforts relied heavily on aerobic metabolism, similar to both road race examples. You can see that for the 100-mile mountain bike race, 58% of it was spent between Zones 2-4 making this race effort the most aerobic effort of all the races. But on the flip side, 23% of the Pro XC race was spent in Zones 5-6 making this race the most reliant on anaerobic energy of all the race disciplines. It is also important to note that Jeremiah spent four seconds at the Cohutta race and seven seconds at Fontana race in zone seven. In conclusion, it is important to realize the large role aerobic metabolism plays in most, if not all, cycling disciplines. At the same time, it is also important to realize how much of certain intensity is needed to do well for each specific type of race. To do well in a XC mountain bike race, a well-timed focus to improve VO2 max and anaerobic capacity efforts needs to take place. If it is a road time trial race, a large focus needs to be placed on gaining endurance and power in zones 3 and 4. But underlying even the hardest efforts on the bike is the role of aerobic energy. It is not always about how hard you can go, but how often you can go hard – that takes aerobic endurance. Don’t miss: How Important is Anaerobic Energy in Cycling? Part 1.